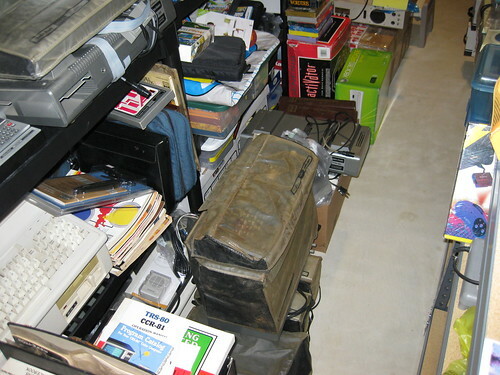 Hiding down there on the bottom shelf is the monitor-less Model III. 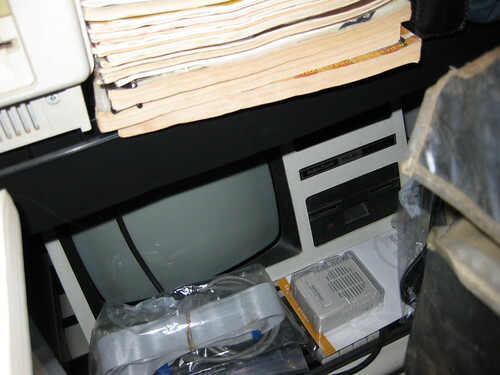 This is the infamous one where the seller had sent it to me in a tissue paper box with thin walls, so the monitor naturally imploded. 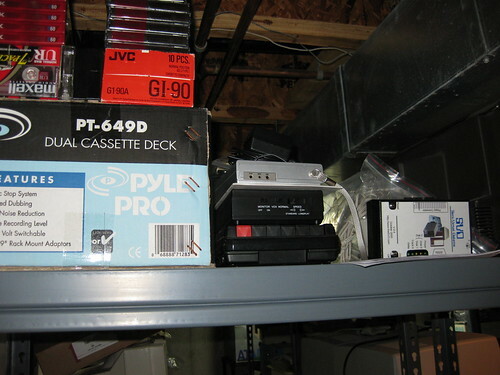 I mostly scavenged this for parts for my Model IV. 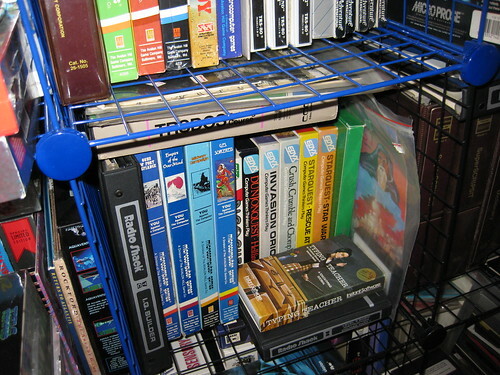 In between the Sony PSP stuff and the Radio Shack Micro Color Computer (MC-10) on the top shelf is loose TRS-80 Model x software, consisting of cassettes and disks. 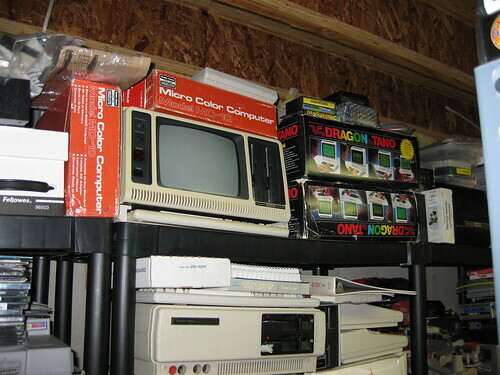 Next to the MC-10's and Tano Dragons is a spare TRS-80 Model 4P with I believe a bad disk drive or screen. I'll check again after it gets pulled down. 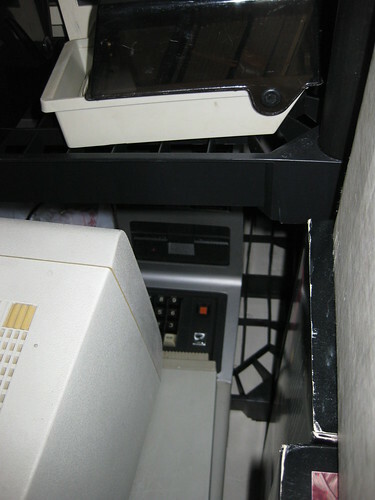 Below the "Tandy Colour Computer 3" is a TRS-80 Model I setup. 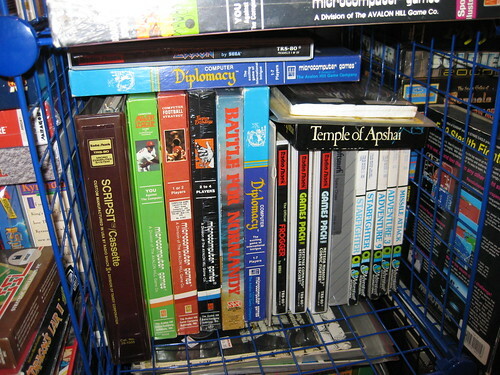 In that top box is various literature. To the upper right corner is another Model I setup. Behind it (and what you'll see part of in the next pictures) is the Model 4 and a working 4P (though the latter is pretty well hidden). A wider angle shot showing the other Model I setup and some more literature and software, and the view from the other side. 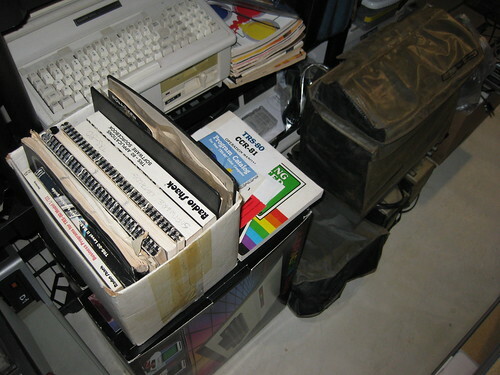 This is actually the Commodore PET shelf, but the vast majority of it - if not all of it - is multiplatform stuff, including TRS-80 Model x.
I'll also be using one or more of these cassette drives and the SVD, which is a multiplatform interface to create a virtual disk drive off a modern PC. 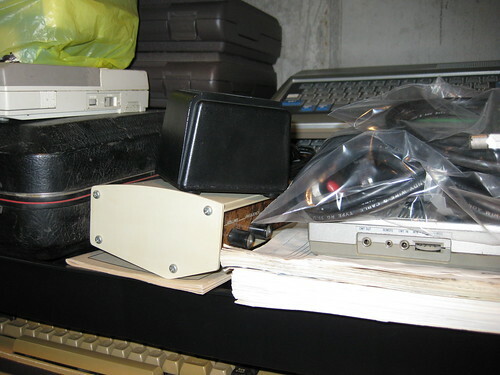 I'll also try to get the Votrax speech synthesizer working with one of the TRS-80 systems. See you at Part 3. I see.... everything! 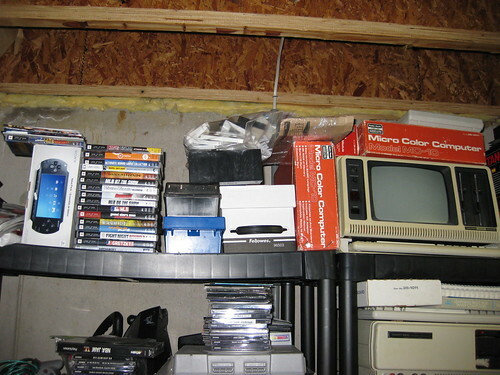 Man, that's a lot of vintage stuff! 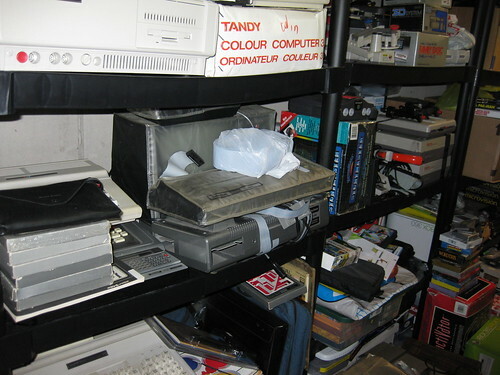 Too bad I didn't have the foresight to keep all my old videogame and computer stuff. What little I have is in poor shape. I wouldn't mind seeing the Model 1 in action again. Hey there! 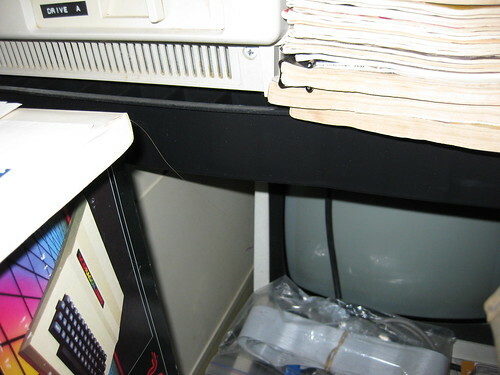 Do you have any of the TRS-80 system desks with the holes for the keyboard and monitor/EI? I'd love to buy one and would pay a hefty sum! Sorry, no. 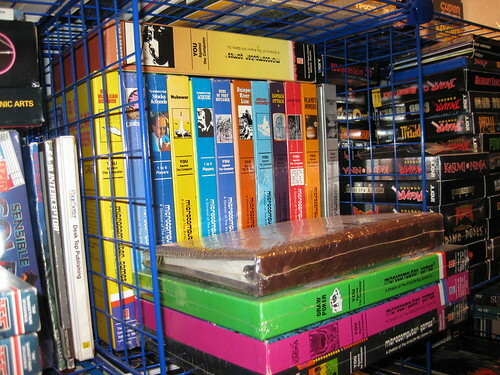 Are you referring to the one for the TRS-80 Model II? 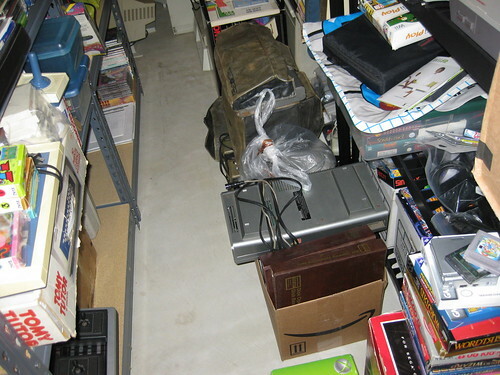 In any case, I don't have anything like that and never will because of space restrictions. It's hard enough storing all the monitors and printers.